It's a power plant. 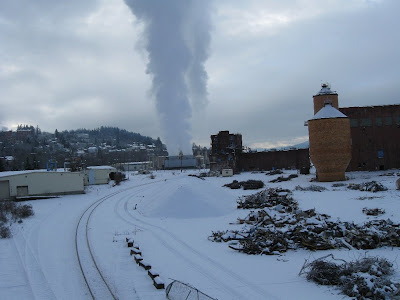 See also Future heating district for Bellingham? Used to be for cogeneration when GP was still going. GP benefited from its waste heat. Now it's just a power plant (burns natural gas), but could play a cogeneration role in future waterfront development. 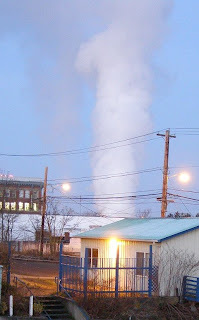 Steam rises part of the time when plant is in use. Riding my bike around town snapping images. 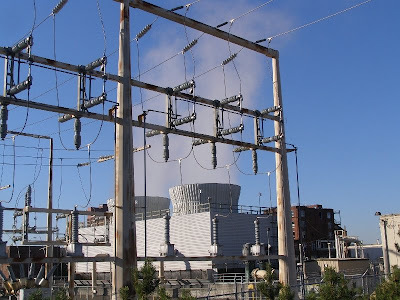 With energy issues making news, here is the cooling tower and power lines by Encogen power plant in Bellingham. Kind of like "found art." Modern art.